The initiative was profiled in major New Zealand publications, including "Stuff". New Zealand's Associate Environmental Minister Eugenie Sage declared the campaign "an amazing initiative". Sage described it as "a great example for other communities in New Zealand and bigger cities... [that] can inspire others." Belinda Schmid Winner of CineStory Foundation 2018 Fellowship Prize. The Book of Conrad reviewed as part of Thessaloniki Documentary Festival main slate by the International Federation of Film Critics. For full review, click here. On November 15, The Book of Conrad will be screening at The Museum of Contemporary Art in Vienna, Austria! CAConrad and The Book of Conrad cited in The Paris Review! Read more here. On June 25th, The Book of Conrad will screen at Naropa University's Performing Arts Centre. Special thanks to Naropa's Jack Kerouac School of Disembodied Poetics for making this screening possible! To celebrate Poetry Month, the Huffington Post interviewed CAConrad. In the interview, Conrad discussed Belinda Schmid, David Welch and The Book of Conrad. Read more here. On March 16, 2017 The Book of Conrad screened at the Zurich Institute of Art, in Zurich Switzerland. To find out more, click here. Delinquent Films are excited to announce the NYC premiere screening for "The Book of Conrad", on Saturday August 27th at Anthology Film Archives! Tickets are now available, and can be purchased here. The Book of Conrad has been scheduled to play at Norwegian Festival of Literature, Scandanavia's largest literature festival, in association with the Lillehammer Film Society. 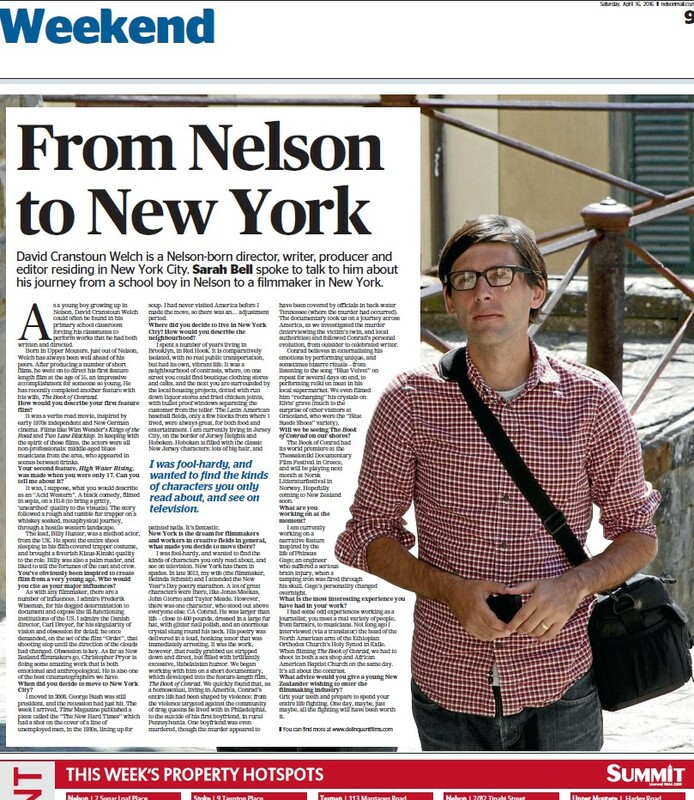 Read in Norway's "Daglabadet"
David Welch was recently profiled in the Weekend edition of New Zealand's Nelson Mail, and "Stuff". Click here to read more. Praise for The Book of Conrad by Flix (Greece), who describe the film as a "queer gospel", and a “unique [and powerful] experience”. The film is “a liberating encounter with a rare mind, somewhere between a favorite aunt and envoy of Elvis on Earth… spreading his hands in every corner of alternative culture... and if those hands have nails painted with glitter, even better.” Click here to read more. As part of the 18th Thessaloniki Documentary Festival, Belinda Schmid and David Cranstoun Welch (The Book of Conrad) attended a press conference. Click here to read more. Delinquent Films are proud to announce that "The Book of Conrad" will be part of the official selection in the 2016 Thessaloniki Documentary Film Festival this March, in Thessaloniki, Greece. Regularly cited as one of the world's "top 10" documentary festivals, the festival focuses on "filmmakers with unique cinematic voices [and] documentaries that explore... social and cultural developments [throughout] the world". This year the focus of the festival is on the lives of significant artists, including the legendary documentarian, Claude Lanzmann. To find out more about the festival, go to the Thessaloniki Film Festival website. Interview with CAConrad about "The Book of Conrad"
CAConrad interviewed by LAMBDA about The Book of Conrad. Click here to read more. Coldfront writes up "The Book of Conrad"
Poetry Foundation writes up "The Book of Conrad"